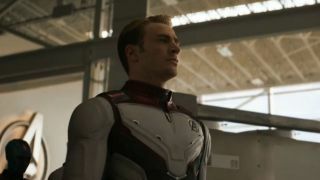 Chris Evans says most of Avengers: Endgame is a "visual spoiler" – but what does that mean? Puzzled as to why we haven’t seen much of Avengers: Endgame yet? Sure, secrecy is key and fans are tired of trailers that spoil everything scene-by-scene in painstaking chronological order but, according to Chris Evans, there’s another reason. That’s because most of the movie is, in an interesting turn of phrase, a “visual spoiler”. Then Evans almost gives the game away. He starts by saying “a lot of the characters have…” before trailing off, stopping himself (“probably shouldn’t have even said that,” he reveals), before the Marvel ninjas inevitably take him down for ruining the biggest Marvel movie ever. Have what, exactly? Time travel powers? Asthma? Either way, there’s a very good reason why we’ve been dancing around the same old footage over and over, we just don’t know why yet. So, if we got to see more of Avengers: Endgame, it’d ruin everything? That sure sounds like one extra notch in the time travel column to me, especially as whispers and rumours have been whipped up surrounding Earth’s Mightiest Heroes returning to the Battle of New York from 2012’s Avengers for some time. It could even be that some dead heroes get un-dusted earlier than we thought. Evans, himself, says he has watched the opening hour of the confirmed three-hour Avengers: Endgame runtime and has already “choked up” on three occasions. Well, Cap, we’ve watched about 90 seconds and have cried PLENTY more times than that – and, as he makes abundantly clear, there’s still a whole lot more shocks and surprises to come. We've got a few potential visual spoilers of our own, so why not take a look at some of the best Avengers: Endgame theories?